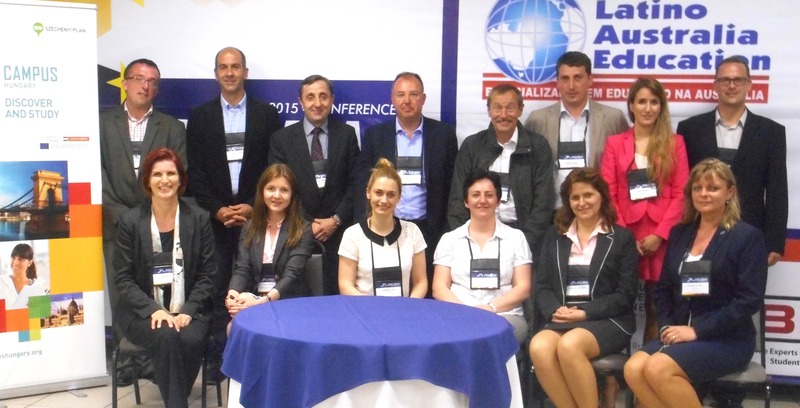 Szent István University (SZIU) was present at FAUBAI 2015- 27th edition of the Annual Conference of the Brazilian Association for International Education (FAUBAI) - in Cuiabá, Brazil from 25 to 29 April 2015. The event provided a unique opportunity for participants to meet their partners and deepen the existing inter-institutional relations. Delegates from countries participating in Brazilian scholarships programmes attended FAUBAI 2015 together with the international relations leaders of Brazilian higher education institutions. This year ten Hungarian higher education institutions including Szent István University, the Hungarian Rectors’ Conference (HRC) and the Campus Hungary Programme were given the opportunity to send their representatives to the conference. Szent István University was represented by Dr. István Szabó, Director for International Relations and Dean of the Faculty of Mechanical Engineering, who was elected the President of the Committee on International Affairs of HRC. He had official meetings with the representatives of two Brazilian partner universities of SZIU (Federal University of Mato Grosso and University of Vicosa); both institutions signed a cooperation agreement with SZIU in 2014. Dr. István Szabó also met the Director for International Relations of University of Lavras to finalise the cooperation agreement between the institutions, which was initiated by the Department of Aquaculture, Faculty of Agricultural and Environmental Sciences. The importance of bilateral agreements will increase in the future since there will be a stronger focus on the sending institutions in the new period of the Brazilian Science Without Borders scholarship programme in which 100 000 scholarships will be distributed. Hungary was the first Central European country that joined the programme in 2012 so the courses of Hungarian higher education institutions were available among those of the largest countries such as the USA, Canada, Japan, the UK, Germany, France, Italy, Spain, Portugal and the Netherlands. Science Without Borders, a scholarship program supported by the Brazilian government, allows 100 000 Brazilian students to spend an academic year at a foreign university between 2012 and 2015. The students attend natural science, engineering, health sciences or information technology courses. In Hungary, approximately 2000 scholarships have been awarded since July 2013, the Brazilian students have learned in 18 Hungarian higher education institutions altogether. The delegation was funded by the Campus Hungary Programme to which Szent István University has successfully applied several times in the past eighteen months.